Go South on I-95 to the North Miami area (if you are on the Turnpike stay to your left and get off in Miami - Do not take the Turnpike Extension South towards the Keys) From I-95 take the 826 East Exit (stay to the right). At the end of the exit ramp - at the very first street light you come to which is N.W. 2nd Avenue, turn Right. Continue for one short block and turn Right onto N.W. 165th Street. Continue Past the vacated Mercedes Dealership and Residential Condo on your Left, next Left is our office complex, the sign reads “Golden Glades Office Park”. Turn Left into our Complex and we are in the 520 Building, which is the second building from the front. You can park only at the named parking spaces labeled "Leiter Perez". I-95 North, and Exit N.W. 151st Street and at the end of the Exit Ramp Continue Straight (Do Not Turn). Continue for about 1/2 Mile, and as soon as the Road Begins to Bend to the Right we will be the very first entrance on your Right - The Sign Says “Golden Glades Office Park”. Turn Right into our Complex and we are in the 520 Building, Suite 209, which is the Second Building from the front on your left. You can park only at the named parking spaces labeled "Leiter Perez". Take the Palmetto / #826 North & East up to North Miami where it ends and becomes 167th Street. At that very first light when the highway ends turn right onto N.W. 2nd Ave. Go to the very next light and turn right onto NW 165th Street. Continue for about 1/2 mile and we are the 4th driveway past the Mercedes dealership - on your left. 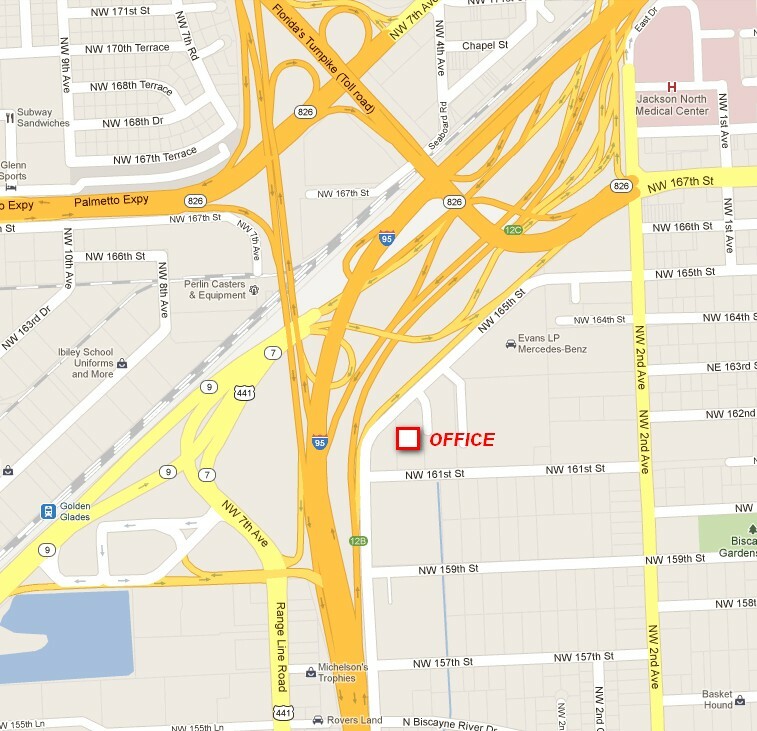 ”Golden Glades Office Park” - Building #520 - Suite #209. You can park only at the named parking spaces labeled "Leiter Perez".